But it's not just that – at the price of a wood-burning stove, you also get an engineer a personal firing aid right in the middle of your living room! 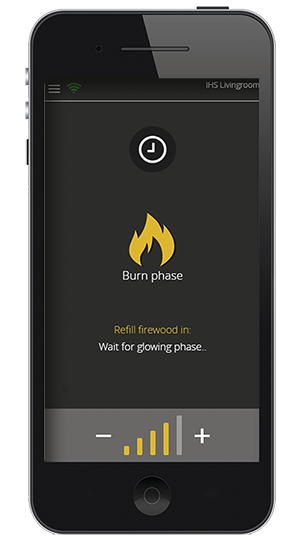 Our HWAM® SmartControl™ app allows you to easily set up your desired room temperature on a mobile telephone or tablet – and the app even reminds you when it's time to fill up with firewood again. The only thing you have to do yourself is light the fire and close the door. Heat storage in a wood-burning stove is the combination of the wood-burning stove's ability to quickly and comfortably distribute the convection heat and the mass stove's ability to store the heat. The compartment can be filled with a large amount of stone. Stone has a special ability to store heat from the wood-burning stove, which will then slowly be emitted into the room, even long after the fire has died. Tests show that stone in the small heat storage compartment will keep warm for up to 10 hours, whereas stone in the large storage compartment will keep warm for up to 14 hours after the last stoking. As an extra feature, the HWAM 3500 Series, HWAM 7100 series and HWAM 3650 and HWAM 3660 have a knob which regulates the convection air to the heat storage compartment. When the convection damper is closed, the heat stored in the stone will be retained in the heat storage compartment for as long as possible; once the damper is opened, the heat will be distributed to the room as quickly as possible. Most wood-burning stoves today are made of sheet iron. Sheet iron gives the opportunity to make designs that are not possible with cast iron. Its smooth surface gives the wood-burning stove the same finish as other pieces of furniture in the house. Furthermore, sheet iron begins to radiate heat upon lighting the stove. The melting point of sheet iron is 1,600 degrees, while that of cast iron is only 1,200 degrees. Cast iron can also crack if heated too quickly, which is impossible with sheet iron. The heat is transferred by a natural air current, and not by heat radiation. This results in a pleasant indoor climate and a uniform temperature throughout the entire room. Another advantage is that the outer cap of the wood-burning stove does not become especially hot. This is to say that furniture can be placed quite close to the wood-burning stove. For this reason, it is important that the glass pane on a HWAM wood-burning stove does not become sooty during combustion. HWAM has developed a technique that ensures that the glass pane always receives heated air from three sides in order to prevent it from becoming sooty. The automatics system ensures that the wood- burning stove is easy to light. The user does not have to spend time adjusting the air supply. Automatic adjustment to the optimal, environmentally friendly combustion. Consistent heating level throughout the entire combustion period.